Wardrobe shelf storage unit, light wood. Condition is Used. Lower full width drawer, door on one side with two hanging rails. solid wood nice grain pattern. Good used condition. Attractive well made piece of furniture. BMF - Modern Style Furniture! RENEE 155 SIDEBOARD ✔. RENEE 70CM WIDE WARDROBE from RENEE Range modern furniture system is ideally suited to any modern living room. 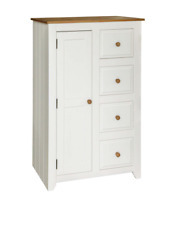 The classic design of THE RENEE 70CM WIDE WARDROBE will give splendour to any room. Wardrobe size :approx. - W80cm x H187cm = (W32" x H73.5"). Gloss Grey / Oak Veneer 1 Door Corner Wardrobe. Oak Veneer carcass. 1 Door Corner Wardrobe. 1 Door Wardrobe. 2 Door Wardrobe. 2 Door Wardrobe With Mirror. Corona is built from quality pine sourced in Brazil. Solid Pine (back of unit is plywood). Try to use the product only for it's intended purpose. Living room furniture for example is not designed for outdoor use. Wardrobe size :approx. - W40cm x D52cm x H187cm = (W16" x D20.5" x H73.5"). Gloss Grey / White 1 Door Wardrobe. 1 Mirrored Door Corner Wardrobe. 1 Door Wardrobe. 2 Door Wardrobe. Gloss grey door. 3 Drawer Bedside Cabinet. Wardrobe size :approx. - W40cm x D52cm x H187cm = (W16" x D20.5" x H73.5"). Oak Veneer 1 Door Wardrobe. Oak Veneer carcass. Oak Veneer Door. 1 Door Wardrobe. 1 Door Wardrobe With Top Storage Box. 1 Door 2 Drawer Wardrobe. Wardrobe size :approx. - W40cm x D52cm x H187cm = (W16" x D20.5" x H73.5"). Gloss Grey / Oak Veneer 1 Door Wardrobe. Oak veneer carcass. 1 Door Corner Wardrobe. 1 Door Wardrobe. 2 Door Wardrobe. 2 Door Wardrobe With Mirror. Wardrobe size :approx. - W40cm x D52cm x H228cm = (W16" x D20.5" x H89.5"). Oak Veneer 1 Door 1 Top Storage Box Wardrobe. Oak Veneer Carcass. Oak Veneer Door. 1 Oak Veneer Top Storage Box. 1 Door 2 Drawer Wardrobe. Corona 1 Door Wardrobe in Distressed Waxed Pine. HANGING AREA OPENING WIDTH W425. SHELF OPENING HEIGHT H230. SHELF OPENING WIDTH H425. DOOR SIZE W420 H1590. HANGING AREA W520 D520 H1360. Extra Information. 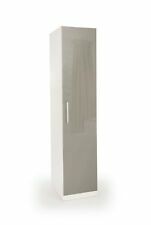 Corona Grey Single Armoire Wardrobe. Washed Pine, 1 Mirrored Door. Black Trim. The whole thing should take 2 people about an hour and a half to assemble. A wall fixing kit is included, great peace of mind if you have young children in the house. The paint is applied to clear wood or MDF to give a crisp, clean finish. Natural wood drawer interiors. Drawer runners: Solid pine supplied loose. LOWEST PRICES ON THE WEB. We at FurnitureRus Committed to bring you best furniture deals online. 308 3423 24. Wood Type: Distressed Waxed Pine. HANGING AREA OPENING WIDTH W425. SHELF SPACE W520 D520 H275. SHELF OPENING HEIGHT H230. SHELF OPENING WIDTH H425. DOOR SIZE W420 H1590. HANGING AREA W520 D520 H1360. Wardrobe size :approx. - W40cm x D52cm x H187cm = (W16" x D20.5" x H73.5"). Gloss White / Oak Veneer 1 Door Wardrobe. Oak Veneer carcass. 1 Door Wardrobe. 1 Door 2 Drawer Wardrobe. 2 Door Wardrobe. 2 Door Wardrobe With Mirror. VonHaus Beige Canvas Effect Wardrobe & Storage Drawers. Two spacious full length shelves, double stitched for extra strength and each with a maximum load capacity of 5kg, provide the perfect space for folded clothing, accessories, storage boxes and even footwear. VidaXL Wardrobe Chipboard 106x36.5x192 cm Beige. Made of chipboard, this clothes storage unit is sturdy and durable and will suit any decor. Material: Chipboard. Our stylish and practical wardrobe presents a versatile storage solution for even the smallest bedrooms. W:660 x D:555 x H:1877. Wardrobe With Dressing table with drawers in a good condition Pick up please. New Bathroom Ceramic Toilet Suite Cistern Black Seat Wall Faced Soft Close Flush. Our stylish and practical wardrobe presents a versatile storage solution for even the smallest bedrooms. Made of chipboard, this clothes storage unit is sturdy and durable and will suit any decor. Hanging Rail Included Yes. Hanging Rail Orientation Left to right. Number of hanging rails 1. Wood Finish (Black Oak/Gloss Black Colour) Oak. Wood Finish (Walnut/Gloss Black Colour) Walnut. Soft Close Doors Yes. What should I do when it arrives?. Coated Wood. This item is made from solid wood. Our modern, practical wardrobe presents a perfect storage solution for clothes and will add a stylish touch to your bedroom decor. Corona 1 Door Wardrobe in Distressed Waxed Pine. HANGING AREA OPENING WIDTH W425. SHELF OPENING HEIGHT H230. SHELF OPENING WIDTH H425. DOOR SIZE W425 H1590. WE WILL NOT TAKE IT BACK. HANGING AREA W515 D515 H1350.